Ramhlun North FC take first leg lead in MPL Playoffs! Home / Indian Football / General / Ramhlun North FC take first leg lead in MPL Playoffs! 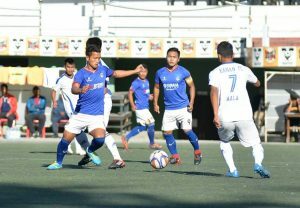 Ramhlun North FC earned a well deserved victory against Kanan FC to set one foot back in the Mizoram Premier League with a 3-1 win in the MPL Playoff. Seventh-placed Ramhlun North FC are locked in a playoff battle with second placed MPL-8 qualifier Kanan FC. A first half brace from Jessy Vanlalmuana and a goal from Lalliansanga was enough to seal a comprehensive lead in the first leg. A spot kick from Lalbiaknia Royte in the second half gives a glimmer of hope for Kanan FC going into the second-leg. The second-leg will take place on December 7, 1:30 PM at AR Lammual. Previous VIDEO – FC Pune City: Origin Story – Part 2 – Rohit Kumar! Next NEROCA eye second spot as Indian Arrows come calling!